I started this bag so long ago that I can't even find the blog post of it's inception. I know I had a Japanese Patchwork book that inspired it's beginnings. with a charm pack that I particularly loved the colours of. 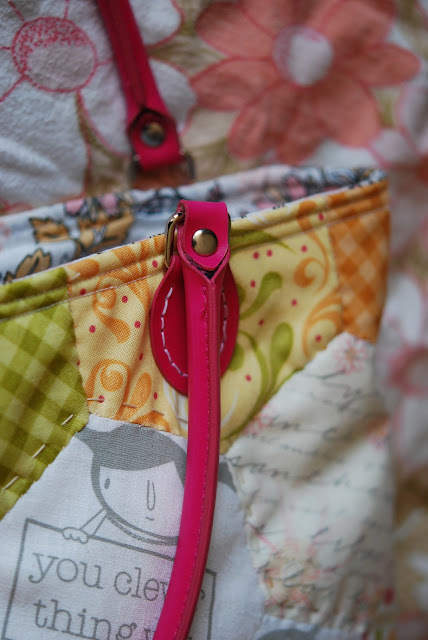 I did a wee bit of hand quilting here and there to hold it together. I love seeing all the wee stitches like this. i cut through the hand stitching and lots of the edges came undone. I'm not sure how I should have done it really. Aren't the colours lovely? soft grey, pink, lemon and a burnt orange. Then I used my second and last set of handles on this bag. I'm definitely going to order some more, they are fantastic. Annie had claimed it for her wooden bowls. "Thanks for the nice bag for me mummy" she chirps. I can't give it away. So Annie can use it. for these two scraps from Auntie Cookie. or to use up an unloved UFO if you have one! Nice one Annie (hee hee!) Proving yet again that she has impeccable taste! Annie, clever girl knows how to get herself a lovely bag for her things. She has great tasted as I love it! Where do you get the handles? Are they recycled? Interesting post. Now you can use these indian directories to promote shopping bags import & export business. What a neat bag! Cool idea. it is gorgeous and those Auntie Cookie hexies are too cute!